Control your Philips Hue lights using a traditional light switch with the Click for Philips Hue. The Click is wire and battery free and can be mounted almost anywhere in your home. Enjoy smartphone-free access to dimming, your favorite light scenes, and much more. This Philips Hue white starter kit + free switch bundle has everything you need to get started with smart lighting. It contains four bulbs and a bridge to operate them—it also includes a RunLessWire Switch so that you can control your entire light setup with a physical button on your wall. As long as you have an internet connection on your smartphone, you can control your lights from anywhere. You can even automate them on any schedule that you wish. Why settle for old and simple lighting when you can have a smart lighting system like this? The Philips Hue White Starter Kit E26 plus RunLessWire Switch contains four bulbs and a bridge to help you operate them. The list of features is quite impressive. Aside from functions you'd expect, like switching the lights on and off and dimming them, you can also use geofencing, set timers, change colors of the lights and even control the entire kit while you're away from home. The free Switch adds physical wall controls to this setup. Bridge + Switch already included: This Philips Hue Starter Kit bundle includes the Philips Hue Bridge, which connects your lights directly to the app, along with the RunLessWire Switch. Within the mobile app you can control your entire Philips Hue lighting-system and also have a wireless switch on your wall. Schedules and geofencing: Just set up time-shedules in the app and control your lights via timetable. Turn it on in the morning so you can wake up without a clock or activate geofencing so that the lights turn on automatically when you return home and turn off when you leave. Voice control with home assistants: Take advantage of Philips Hue's wide compatibility and control your lights using all of the leading voice assistants. Compatible with Alexa (Amazon Echo), Apple HomeKit, and Google Home. Just speak your command and watch as your lights change. Control from anywhere: With the Philips Hue app, you'll be able to control your lights from anyways—whether you're on your couch, of the other side of the world. You only need an internet connection. Philips Hue bulbs bring a whole host of smart features with them and the Bridge is the key. You can add up to 50 bulbs to a single bridge so you can easily control your entire house.With this smart light starter kit, you can automate your lights using schedules and geofencing and control them even when you're not at home. Or switch your lights on and off using just the sound of your voice with a smart voice assistant, like Google Home, or use our fingers with the RunLessWire Switch. What makes this bundle special? This Philips Hue starter kit comes with four bulbs, the Hue Bridge, and a Switch. If you're looking for a physical control option and don't want to just use the app, this kit has you covered since it already includes the RunLessWire Switch. The switch can be placed very easily on any wall. 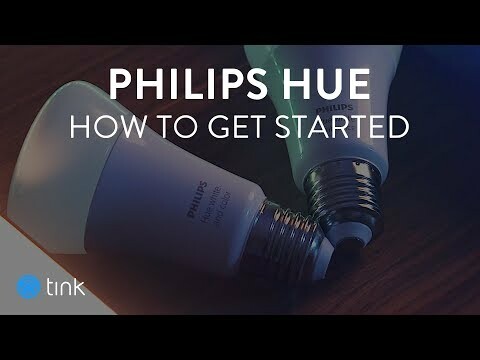 The Philips Hue White Starter Kit plus Switch is a great option if you are just starting out with smart home products and want to add the easiest method that will become one of your favorite features. Even if you have existing smart home products, it will most likely integrate with those due to its vast compatibility. It's a very straightforward process to get this kit set up. You don't need to be an electrician to get started. Well-made and of solid construction. Definitely adds character to any living space. The Hue apps for Android and iOS give you complete control over how you want these bulbs to work. A great all-around design. There are a lot of functions and it's likely that you won't even get around to using all of them right away. The bulbs included in this kit are designed to provide at least five years of on-time. Day in and day out they'll add a new glow to your home. A great-looking addition to the home and the lighting designs you can make only add to the charm. Philips adheres to the same data security and privacy standards of all the big tech companies, so you can rest easy. There is hardly a better entry point for smart lighting. This kit is well-priced yet does everything you could want and then some. These bulbs provide more than 50,000 hours of lighting, or about 5 years. Can I dim the lights with my voice? Yes, you can use Alexa, Siri and Google Assistant to dim the bulbs. What's the difference between this and a light switch? A switch lets you switch on/off and dim, whereas the kit lets you do the same plus control individual bulbs, change colors and use geofencing. Can I dim my Philips Hue bulbs with Click? Yes. To dim your lights with Click, press and hold the rocker after configuring the "Hold" Touch in the Philips Hue app. Can I manage multiple Philips Hue scenes? Yes. The default dual-rocker configuration offers four buttons for accessing your four favorite scenes.